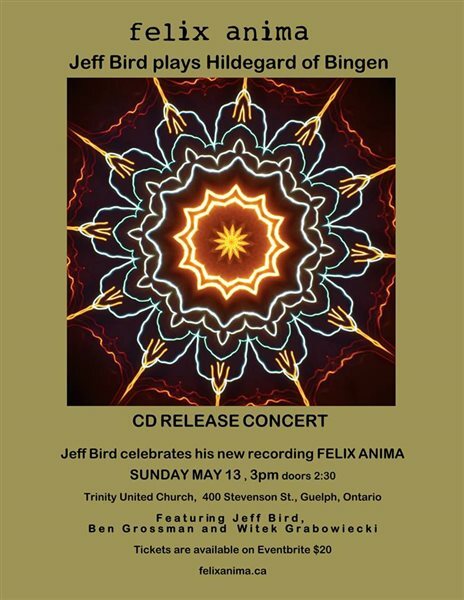 That’s how multi-instrumentalist Jeff Bird describes his latest work, felix anima, interpretations of the music of Hildegard of Bingen (1098-1179). It isn’t easy to put into words the beautiful and haunting experience of listening to Bird’s latest album. Contemplative, uplifting, sacred, transcendent. Bird’s thoughtful approach to combining harmonica, a droning Shruti box, and a range of other instruments, offers contemporary audiences a whole new way of encountering the medieval abbess’ impressive musical works. “…spectacular, sublime, moving and beautifully interpreted and produced. A true piece of art from an exceptional, mature artist, interpreting the music of a genius” - Russ Christianson , M.I.R., B Comm. The melodies heard on felix anima comes from the celebrated Hildegard of Bingen, an abbess in 12th century Germany, still known today for her impressive theological, scientific, dramatic and musical works. A saint, a Doctor of the Church, a mystic, a feminist, and a visionary, Hildegard of Bingen has captured the imagination of audiences, artists, and musicians around the world. The artwork for the CD, also created by Bird, is a beautiful visual that combines the transcendental with the electric, producing a stunning mandala of sacred inspiration and hypnotic form that reflects and enhances the music itself. The CD has already received considerable praise from everyone encountering it. It was featured on CBC’s First Play from April 19 - 26. Jeff Bird is a founding member of the seminal folk group Tamarack. With Cowboy Junkies he was part of the legendary The Trinity Session and continues to record and tour the world with them. He has realized 16 recordings of his own as a soloist and collaborator, and has scored music for film, television and dance. He is also an experimental filmmaker and performance artist whose work has been showcased at festivals around the world, from Dawson City, Yukon to Vladivostok, Russia. As a multi-instrumentalist Bird has appeared on over 100 recordings and has worked with such diverse artists as Jane Bunnett, Loreena McKennitt, Natalie Merchant, Scott Merritt, Townes Van Zandt.